Black Friday is only nine days away. That’s right: you only have a little more than a week to prepare for the impending chaos that goes hand-in-hand with snagging the year’s best sales. Sure, it feels kind of ironic that just hours after we spend Thanksgiving sharing delicious meals and gratitude with our friends and family, we then trample over each other and fight for our lives to make sure we get low prices. But do, and then we do. Or, at least, some of us do. To get geared up for next week’s festivities, we present to you the eight most shameful Black Friday moments in recent history. Disclaimer: a disproportionate amount take place at Walmart. 1. 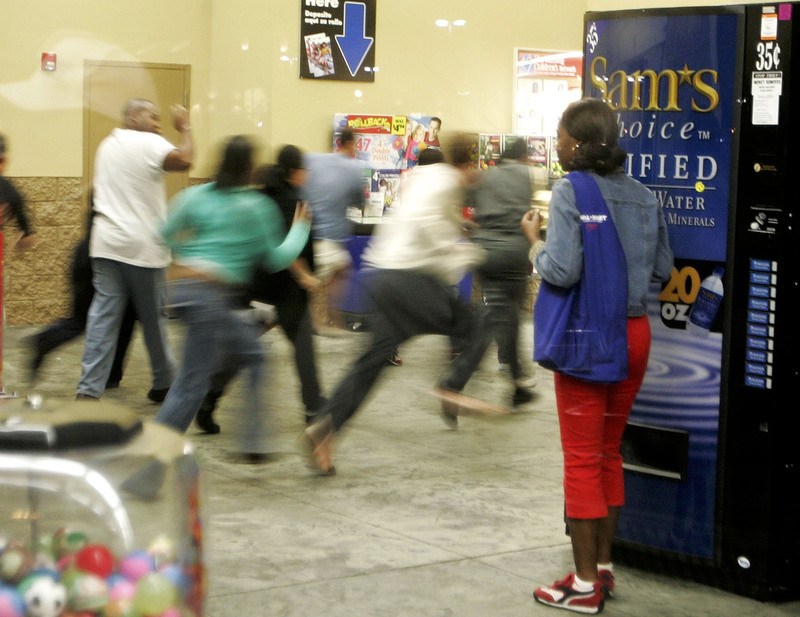 In Michigan, a stampede of shoppers rushed into Walmart when doors opened at 5:00 a.m., and one pregnant woman had to be taken away in an ambulance. 2. One woman used pepper spray on other shoppers, including children, because she was trying to get a hold of an Xbox. There was too much mayhem for the cops to catch her, so she left without being identified. 3. That time customers screamed and fought over a $2 waffle machine. 4. That other time customers went nuts for $6 sheets. 5. One man was slammed to the ground at Walmart and beaten by a security guard, because store officials thought he was shoplifting a video game for his grandson. 6. On Long Island in 2008, a WalMart employee was killed after shoppers knocked him down when the doors opened. 7. Two people were shot and killed on Black Friday in Los Angeles after getting into a fight at Toys R Us. 8. While waiting in line for a Kmart to open in Sacramento, one man threatened to stab pushing customers in line behind him. So keep your wits about you, guys. Last week, Bustle reported on the latest updates for shoppers this Black Friday, erm, Thursday. Some retailers have announced they will be opening at dinnertime on Thanksgiving (which puts the whole “Black Friday” name in question, since it’ll really all be happening on a Thursday). On Tuesday, Walmart announced they’ll hold two major sales events at 6 p.m. and 8 p.m. on Thursday evening —two hours earlier than last year. Shoppers might find this experience more convenient, but it means the already put-upon Walmart workers are being taken away from their Thanksgiving holidays even earlier in order to ensure holiday shoppers can buy their extra-discounted video game consoles. In addition to Walmart, stores like Target, Best Buy and Macy’s have also said they’ll be opening their doors earlier to accommodate shoppers. Hopefully, this will mean the mobs of people who usually camp outside in the middle of the night (and sometimes end up shooting each other in the morning) will lessen.